An underlying threat still exists that could see demerged municipalities again merged into the Montreal megacity, as took place between 2002 and 2005, says Côte St. Luc Mayor Mitchell Brownstein. Residents in municipalities like Côte St. Luc, Hampstead, Montreal West and Westmount voted to demerge in 2004. Later, The Suburban asked Brownstein for more details on his contention. Brownstein declined to reveal further details. “I never said that,” Brownstein countered. We also asked Councillor Dida Berku what she has heard. The election event as a whole was feisty, especially when audience members asked questions — it was akin to an in-person version of the frequently fractious debates on the Let’s Chat CSL Facebook page. Accusations ranged from cyberbullying to overlong vacations to opportunism. Moderator Charles Barchechath moderated the event with strictness and humour, keeping council candidate statements to two minutes and audience involvement to questions on local issues. The possibility of remerging with Montreal is a very scary thought. Cote Saint-Lucers don’t want it. 90% voted to leave Montreal Mega-City. Why would we risk returning to this position that would weaken our glorious city? Want to ensure that we stay the great suburban city that we are today? Want to have complete confidence that your elected representatives stay the course and speak out loudly and keep their promises on this thorny issue? 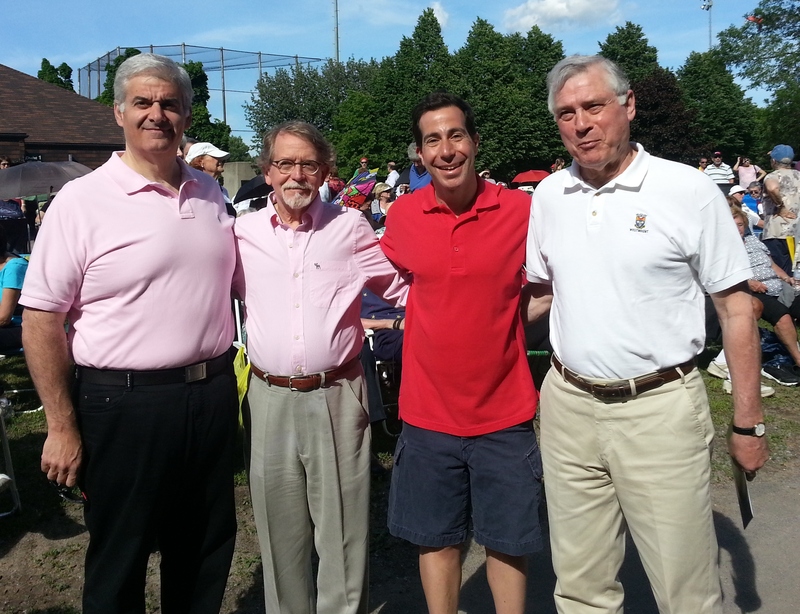 Vote Mitchell Brownstein for Mayor and Glenn J. Nashen for City Councillor of District 6. Trusted Leadership and Proven Experience. The Côte St. Luc election race just heated up greatly, all over the position of some current incumbents during the lead-up to the 2004 demerger referendum. The demergers of municipalities whose residents voted to do so took effect Jan. 1, 2006. As The Suburban reported last week, CSL mayoral candidate Robert Libman criticized incumbent Mayor Mitchell Brownstein for, during the latter’s campaign, denouncing Libman for his stance on the mergers. Libman said last week he did not oppose demergers per se, but the Charest government’s Bill 9, “which would have stripped us of clout and political power and forced us into a ‘taxation without representation’ straitjacket.’” The law was since changed. 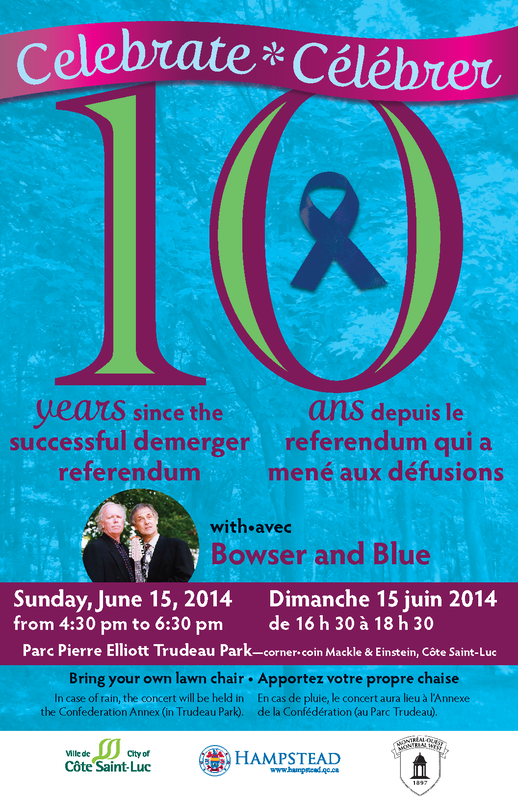 Brownstein countered that Bill 9 gave Côte St. Luc and others the opportunity to demerge. Libman also contended that incumbents Dida Berku, Mike Cohen and Allan Levine supported Côte St. Luc remaining in the megacity. Brownstein replied that Cohen and Levine voted for demerger. Berku says she was majority leader in the megacity, but still signed the register, enabling people to vote in the 2004 referendum. Cohen told us that he worked as a communications consultant for the Côte St. Luc-Hampstead-Montreal West borough, and remained neutral. He signed the register and voted in the referendum. 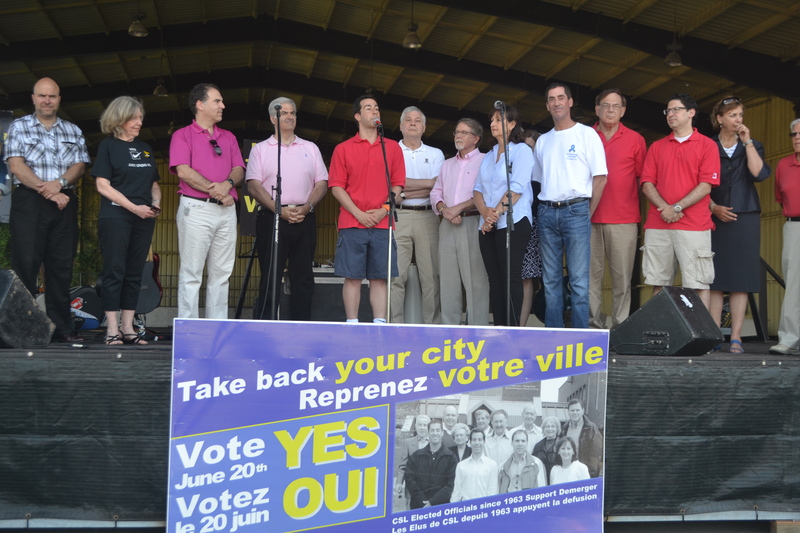 Levine said he signed the register, opposed the stripping of powers from the demerged cities, and “personally supported demergers,” saying it benefits services for residents, such as Emergency Medical Services, in the current City of Côte St. Luc. That’s where we were last week. But this story has taken on a couple of new twists. Last Wednesday morning, Libman sent The Suburban a 2004 flyer counselling a vote against demerging, which he said was circulated a week before that year’s demerger referendum. In a second reply, Levine said that the reference in the flyer to EMS “is totally absurd as the City of Montreal uses their fire department [as first responders], which would have killed EMS. “I knew it then and EMS is my passion, as is Meadowbrook We as a demerged city fought and won to preserve EMS. And this is a major reason why demerger was so wonderful for Côte St. Luc. Also, I never favoured a direct Cavendish-Cavendish link so the claim on Cavendish is ridiculous! Finally, as a demerged city, we have been able to preserve Meadowbrook. We then contacted Libman for his reply to Levine’s response. The mayoral candidate sent us the entire flyer, which includes quotes from several Côte St. Luc, Hampstead and Montreal West residents. Libman also responded to Cohen’s statement to us last week, that he never publicly took a position on the demerger issue and remained neutral. We then asked Cohen for a reply. “I was hired by Robert to handle all media relations for the borough,” the District 2 councillor said. “He was my direct superior and as such he corresponded with me a lot during the referendum period and I completed work he assigned to me. I am sure there are some points of view he had I agreed with at the time, and the same goes for Anthony Housefather, whom as a borough councillor at the time communicated with me regularly as well.” (Housefather was a leader of the de-merger movement). 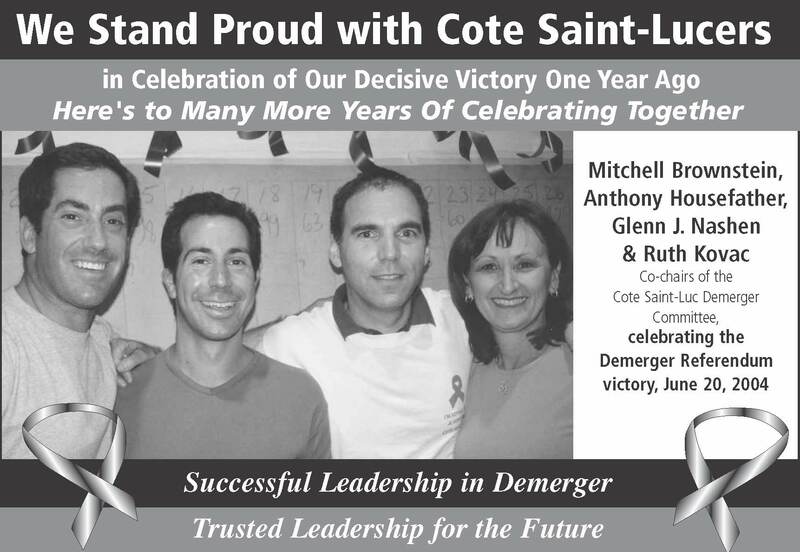 The irrefutable FACT is that Anthony Housefather, Mitchell Brownstein, Ruth Kovac and I co-chaired the demerger campaign and succeeded in getting our city of Cote Saint-Luc back. (There’s plenty of posts on that subject right here on this blog). Had we not done so, CSLers would be voting in the Montreal elections this Nov. 5, would be sending all of our tax dollars to Montreal, would have no life-saving volunteer service, would have lost our police and fire stations in CSL, to mention just a few examples. I have no interest in risking being remerged into Montreal. Don’t you agree? 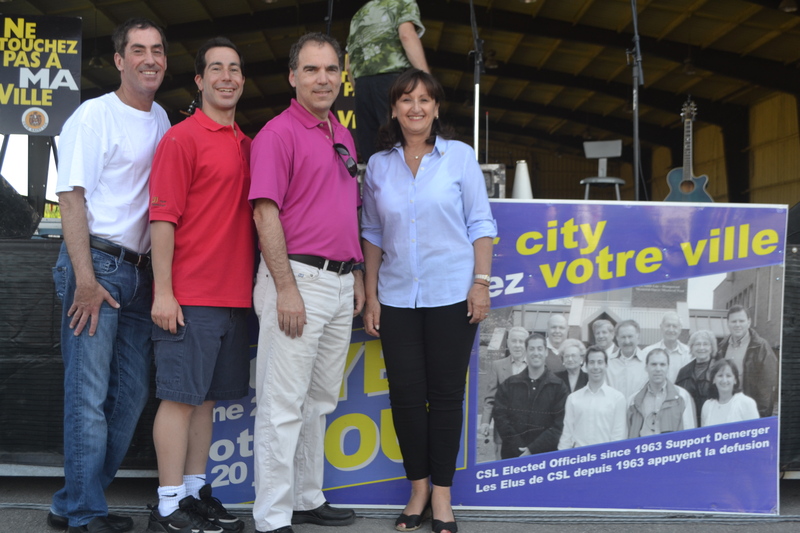 You can rest assured that Mayor Mitchell Brownstein and I (not to mention Councillor Ruth Kovac and others) will fight tooth and nail to ensure that Cote Saint-Luc remains its own proud and independent city with excellent services and close proximity to its residents. The Demerger Decision: Did CSL Make the Right Choice? Powerless under the country’s constitution, Canadian municipal governments often find themselves in conflict with their provincial masters. In 2002, the Province of Quebec forcibly merged all cities on the Island of Montreal into a single municipality – a decision that was partially reversed in 2006. The first book-length study of the series of mergers imposed by the Parti Québécois government, The Merger Delusion is a sharp and insightful critique by a key player in anti-merger politics. Peter Trent, mayor of the City of Westmount, foresaw the numerous financial and institutional problems posed by amalgamating municipalities into megacities. In his book, he presents a stirring and detailed account of the battle he led against the provincial government, the City of Montreal, the Board of Trade, and many of his former colleagues. Describing how he took the struggle all the way to the Supreme Court of Canada, Trent demonstrates the ways in which de-mergers resonated with voters and eventually helped the Quebec Liberal Party win the 2003 provincial election. As the cost and pitfalls of forced mergers become clearer in hindsight, The Merger Delusion recounts a compelling case study with broad implications for cities across the globe. 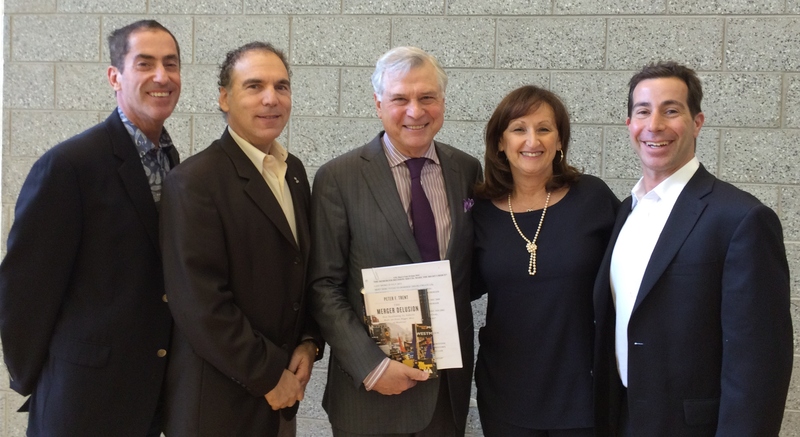 Mayor Peter Trent was the keynote speaker at the annual luncheon of the Cote Saint-Luc Senior Mens Club that took place yesterday at the CSL Gymnasium. Mayor Trent presented his case in excerpts from his book and in news clippings specifically targeting the battle that developed between two former council colleagues, then Councillor Anthony Housefather and Borough Mayor Robert Libman. The Cote Saint-Luc Demerger Co-Chairs, Anthony Housefather, Mitchell Brownstein, Ruth Kovac and myself listened on with keen interest. “How much a month – and an Executive Committee membership – can change things,” Trent emphasized, in questioning Libman’s about-face on the demerger issue. Before a full audience of CSL seniors with sharp memories of the merger years of 2001 to 2005, Trent recounted how Libman made the case for demerger only to flip-flop after his appointment to Megacity Montreal Mayor Tremblay’s Executive Committee. “We were sold a bag of goods,” he said, stating that smaller is better in terms of controlling finances and expenses and ensuring protection against corruption. 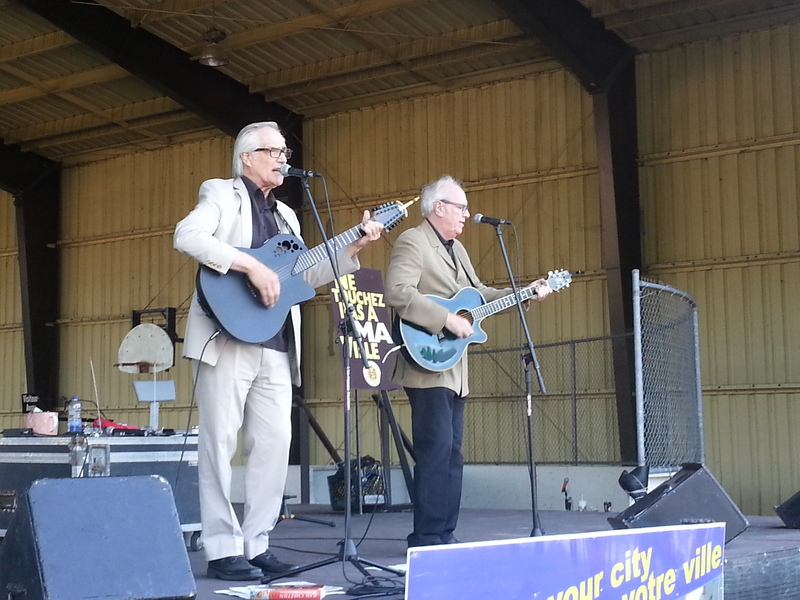 Sure there were a handful of small municipalities that were singled out for illegal practices. But these cases were caught quickly and corrected because “citizens like you, and councils like yours,” are closely watching over everything. That wasn’t the case in Montreal, he said, where corruption ran amuck for a very, very long time. Trent made the case from several perspectives how the promises of the merger did not hold up and how Cote Saint-Luc is infinitely better off now than those former suburbs that failed to demerge. Outremont controls 22% of its budget and is dependent upon handouts from the megacity, Trent stated, while CSL controls 59% of its budget. For more, see Mike Cohen’s blog. Thanks to the Charbonneau inquiry, we’re waking up to long-ignored corruption. The Merger Delusion has the potential to help open society’s eyes to misplanned government structures. The longer we ignore this reality, the longer Montreal will overspend and drift. Aubin: An eye-opener on what ails the city.